There will come a point in the career of almost every litigator where he or she will inevitably need to depose or examine a non-English speaking person in deposition or trial. 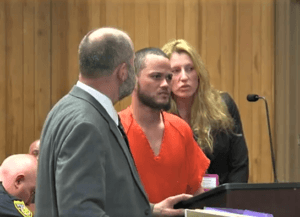 As a court reporter with 15 years of experience, having attended countless depositions over my own career, I have seen the good, the bad, and the almost comically outrageous when it comes to the interpreter depos I have witnessed. Every problem in the above paragraph was the direct result of hiring an interpreter who is not trained in litigation or judicial interpreting. By working exclusively with Supreme Court Certified Judicial Interpreters, these and other roadblocks in due process can be avoided completely. On January 1, 2013, Ohio Supreme Court Rule 88 took effect in an attempt to provide language access services that comply with Constitutional guarantees and with Title VI of the Civil Rights Act (1964), making Ohio one of many State Supreme Courts that certify interpreters to work in all aspects of our criminal justice system and all proceedings in civil litigation. Cleveland Reporting Partners recently had the absolute pleasure of interviewing Roxane King, a Cleveland-based Supreme Court Certified Judicial Spanish Interpreter, to learn all about her training, education, her practice, and just about everything else you would need to know to ensure you are always hiring the right person whenever you are in need of an interpreter for a deposition or trial. The following interview was taken down in realtime by Grace Hilpert-Roach, co-founder of CRP and our most senior court reporter. TODD PERSSON: Roxane, thank you for meeting with us this morning. We appreciate you coming in and talking to us. ROXANE KING: Thank you so much for the opportunity. TP: Absolutely. So you are a Supreme Court Certified Interpreter? RK: Yes. For the Ohio Supreme Court and the Superior Court of California. TP: And what is the role of a Supreme Court Certified Interpreter? RK: The role and duty of the interpreter is to act as a medium between the court and the non-English speaking person. The interpreter is required to transfer all meaning he or she hears from the source language into the target language without editing, summarizing, neither adding nor omitting content or meaning. The court interpreter is a language mediator who, through interpretation, allows the defendant or plaintiff to be linguistically and cognitively present in a legal setting and proceeding. TP: What is the training and education involved with becoming a Supreme Court Certified Interpreter? RK: Certified interpreters undergo extensive training and education. We are taught a breadth of legal terminology and various techniques to be mastered, such as the simultaneous, consecutive and legal sight translation techniques. All three must be mastered and learned to precision in order to become certified. TP: And what is the testing involved? RK: The Supreme Court of Ohio administers the testing required for certification. There are two phases to the testing. The first phase is a written examination, which includes areas of complex legal terminology, court language, and professional ethics and canons. The examinee must pass all areas of the test in order to move on to the next phase. Approximately six months after passing the written portion of the test, the examinee takes part in the oral exam. The oral exam consists of demonstrating oral proficiency in simultaneous and consecutive interpreting, as well as legal sight translation in both languages. A successful candidate must pass both the written and the oral portions of the examination. There are three levels of certification; Certified, Provisional and Registered. The national passing rate is 20 percent, and the passing rate in Ohio is 18 percent, mainly due to the fact there are not any training schools or university programs in judicial interpreting in the state. TP: What is simultaneous interpreting? RK: The task of simultaneous interpreting is extremely complex. Though simultaneous listening and speaking rarely occurs in everyday verbal behavior, we not only are able to listen and speak simultaneously for reasonable lengths of time, but also to carry out complex transformations on the source language message while uttering the interpretation in the target language. Every single word that is being said in the courtroom or deposition is being said in the target language without stopping or summarizing. TP: What is consecutive interpreting? RK: Consecutive interpreting is used in a question and answer format to the witness. The interpreter retains large amounts of information through symbol note-taking techniques and then renders the answer or question without omissions or embellishments. It involves complex mental tasks of language perception, storage, retrieval and generation. Because of this complexity, many interpreters consider consecutive interpreting more difficult than simultaneous. It’s perhaps the most challenging of all types of interpretation. TP: And what is legal sight translation? RK: It is translating and subsequently on-the-spot interpreting of legal documents on the record. TP: So why the need for certification when it comes to interpreting in the legal arena? RK: Well, first and foremost, it is the law. Certified judicial interpreters ensure the highest quality of interpretation. Professional judicial interpreting is provided to assist the court in overcoming the linguistic barrier in the administration of justice in carrying out due process for non-English speaking parties and/or individuals not fluent in English. TP: Does this tie into Rule 88? RK: Absolutely. The Supreme Court of Ohio adopted Rule 88. It took effect January 1, 2013 in an attempt to provide language access services that comply with not only Constitutional guarantees, but also with Title VI of the Civil Rights Act and some of the other regulations that the Department of Justice has established for language access services in cases with individuals with limited English proficiency. CHRISTINE GREEN: What is the difference between a Certified Judicial Interpreter and an ad hoc bilingual acting interpreter? RK: An ad hoc acting bilingual is a person who was either born overseas where they learned the language, or a person who was raised in the United States and spoke that second language at home. Certified Judicial Interpreters have a high expert proficiency in their specialized language. This is a profession, it’s a skilled profession. A Certified Judicial Interpreter is an interpreter who has passed a valid and reliable certification exam administered by the Supreme Court of Ohio. Certified Judicial Interpreters are also mandated by the Supreme Court to maintain our continuing education credits. CG: What are the major advantages of hiring a Certified Judicial Interpreter over a traditional ad hoc bilingual in court proceedings, including depositions? RK: As Judicial Certified Interpreters and impartial officers of the court, it is our duty and ethical obligation to protect the record, bound and under oath as neutral parties. As such, we adhere to all ethical standards and maintain the highest quality of personal and professional conduct. 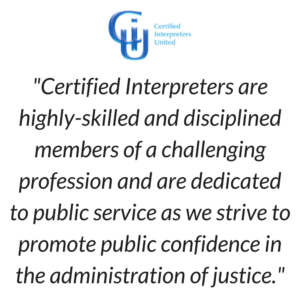 Certified Judicial Interpreters are highly-skilled and disciplined members of a challenging profession and are dedicated to public service as we strive to promote public confidence in the administration of justice. Conversely, an ad hoc acting bilingual interpreter has no interpreter training. He or she will not know the proper techniques or standards. Additionally, if the interpreter has no judicial training or ethics instruction, they will not be familiar with the vast amount of legal terminology and ethical obligations to the court. As a result, a proceeding interpreted by an ad hoc bilingual interpreter can be stricken from the record and not reviewable by higher courts. Without a competent interpreter that is capable of facilitating the complete and accurate flow of information, vital information may not be included, the drawing of facts will get twisted, misunderstanding may be frequent, and most importantly, justice may be denied. In criminal cases, defendants cannot be meaningfully present nor linguistically present to be able to assist in their own defense, receive the effective assistance of counsel, confront witnesses or waive any of their rights knowingly, intelligently and voluntarily. Only with competent interpreting and translation will non-English speakers have access to justice, due process, fundamental fairness and equal protection of law. Certified interpreters are the stamp of approval from the Supreme Court. CG: What sort of documentation do you provide to show that you’re a Certified Judicial Interpreter? RK: Our second canon is representation of qualifications. Certified Judicial Interpreters identify themselves on the record, either in court or at depositions, by stating their names, language of proficiency, and Supreme Court identification number. TP: And you were sworn in with your certification? RK: Yes. All Supreme Court Judicial Interpreters are sworn in. TP: We just talked about ad hoc bilinguals and the differences between Certified Judicial Interpreters. Is there a different type of interpretation that maybe bilinguals are more used to, such as in a business setting or in a meeting, as opposed to what you do? I think the word is “seriatim” interpretation, as opposed to other forms of interpretation. Can you explain a little bit about that? RK: Well, a bilingual interpreter – as I said, to be a well-rounded interpreter, you have to be able to master the court language and also the legal language when in the proceeding itself, following the rules of professional ethics and the canons of the Supreme Court. So just the fact that you’re a bilingual doesn’t justify the fact that you can go in and say “I’m bilingual, so I can interpret exactly and precisely for that record.” The record would then be unreliable, unreviewable and, therefore, it would jeopardize the integrity of the hearing and due process. TP: One of the articles that you included for us to read before we met with you talked about how traditional bilinguals in the business setting will not necessarily interpret verbatim, but they will give a gist of what’s being said, or summarize, and that may be fine or accepted in the business setting. But as a Certified Judicial Interpreter, you are trained in verbatim interpreting? 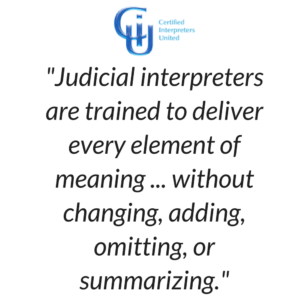 RK: Judicial interpreters are trained to deliver every element of meaning, including paralinguistic features such as audible gestures, pauses, nuances and word connotations without changing, adding, omitting, or summarizing. Therefore, we do not give a gist or summarize what is being said but rather deliver the complete element of meaning in the whole message exactly and precisely for the record. We interpret all testimony in the first person and are only permitted to speak in the third person when addressing the court or counsel. When rendering witness testimony especially, we must maintain the same demeanor, register and language of the speaker. TP: As a sworn-in Supreme Court Certified Judicial Interpreter, you mentioned some canons. What are the canons and/or Acts that you are duty-bound to? 4) Impartiality, conflicts of interest, and remuneration and gifts. We are impartial and unbiased, and we refrain from conduct that may give an appearance of bias. We cannot converse with parties, witnesses, jurors, attorneys, or friends or relatives of any party, except in the discharge of official functions. 5) Professional demeanor and high standards of conduct. 7) Restriction of public comment. We cannot discuss publicly, report, or offer any opinion concerning a matter. 8) Scope of practice. We have to limit ourselves to interpreting and may not engage in any other activities which may be construed to constitute a service other than interpreting. 9) Assessing and reporting impediments to performance. 10) The duty to report ethical violations. CG: As court reporters, we have worked with many interpreters in depositions over our many years of experience. We oftentimes see that interpretations of witness testimony are challenged, and either our audio will be requested or subpoenaed by counsel or the deposition will need to be taken again using a different interpreter. As a Certified Judicial Interpreter with all your training, education and testing by the Supreme Courts of Ohio and California, is your interpretation less likely to be challenged in contentious cases? RK: Absolutely. 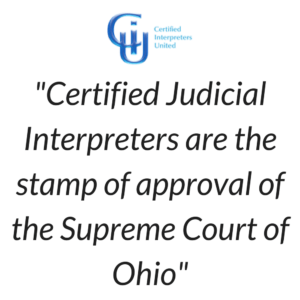 Certified interpreters are the stamp of approval of the Supreme Court of Ohio. Conversely, if the client wants to challenge an interpretation made by someone other than a Certified Judicial Interpreter, we can provide expert testimony as to discrepancies, deficiencies or irregularities. TP: What are the responsibilities during court proceedings involving judicial bilingual interpretation when you notice an irregularity in the interpretation? Can interpreters be experts? RK: Judicial interpreters are in a unique position because we can be considered both experts and impartial officers of the court at the same time. There are several ways of looking at this situation. One, accept the common practice of treating the interpreter as an officer of the court until there is a challenge to an interpretation; then, the interpreter switches roles and becomes an expert witness. Challenging counsel may then voir dire and offer a different version of the interpretation in dispute. In that case, the interpreter, as an impartial officer of the court, can either stand by her interpretation as an expert witness and officer, or request a repetition of the record to validate or invalidate her interpretation. TP: We have also seen from time to time family members or friends of the family, or sometimes even attorneys who may be bilingual interrupt in a deposition when they believe an interpreter’s rendition of testimony is not accurate. As a Certified Judicial Interpreter, can you speak to the appropriateness of this in a deposition or trial setting? RK: Well, I’m definitely not a lawyer, but I can tell you what I’ve observed in the past. The attorney, while performing the duties of an interpreter or questioning the rendition on the spot cannot at the same time effectively represent the legal interest of a defendant or plaintiff. A judicial interpreter carries out a linguistic analysis. An attorney listens, takes notes and undertakes a legal analysis, including evaluating opposing counsel’s evidence, formulating new questions, highlighting or diminishing a fact and gathering more information to support or counter an argument. As for family and friends of witnesses trying to participate in a deposition; this is not prudent and may violate Supreme Court Rules and jurisprudence. Not only will this have a blatant effect on the testimony of the witness, but the delivery of due process could be forfeited. TP: Are you permitted to interpret an audio recording on the spot? RK: Our first canon is accuracy and completeness. If a judicial interpreter is asked to interpret an audio or sound recording on the spot, he or she is automatically not complying with canon number one. Remember, we have taken an oath to follow and comply with our professional canons. The quality of audio recordings changes constantly depending on the circumstances or conditions. There can be a great deal of noise, various people speaking loudly at the same time or not clearly. For all the above mentioned, a judicial interpreter cannot comply with accuracy and completeness interpreting an audio recording on the spot. In these cases, a judicial interpreter must have the prior prepared transcript of the English and foreign language version in hand to be able to render an accurate and complete rendition. On the contrary, the record is jeopardized, as is the defendant’s and/or plaintiff’s right to due process. If a transcript and translation is not provided and the judicial interpreter is asked to continue, then he or she must recuse herself from the case, obviously explaining on the record her reasoning to do so. The judicial interpreter on the case cannot translate the foreign language section of the audio recording on the spot because that would make him or her a potential witness. Recordings must be done by a Certified Judicial Interpreter or translator who has nothing to do with the case, then certified and notarized prior to the hearing or deposition. TP: Let me ask you this; how is a day in the life of a judicial interpreter? RK: I can tell you there is never one boring day or a repetitive day, that’s for sure. I can walk you through a day in the life of a trial from beginning to end as briefly as possible. Trial execution starts the moment you are assigned to a trial. The team of interpreters choose a lead interpreter that is “the voice” of the team. He or she will play the part of speaking to the judge, bailiff and lawyers when needed on behalf of the team. The lead interpreter requests all possible material that can be given to the team for viewing. Police reports, forensic reports, audio transcripts and expert witnesses that will testify have extensive resumes and reports that are complicated in meaning. Of course, all of this information is confidential, and we are under oath to treat it as such. We must gather as much information as possible to commence the creation of our glossaries with the help of our reference guides for the day of the trial. This process can take from 4 to 12 hours or even more. As the day approaches, we gather various times as a team and continue preparing and memorizing vocabulary so we are all on the same page. On the day of the trial, we have an interpreter station set up where we allocate a table for the team in the best sound area of the courtroom, which is difficult. We check interpreter audio equipment. We validate dialect and understanding, train plaintiffs, defendants and lawyers on how we work. In court, during trial, we provide constant simultaneous and consecutive interpreting along with team huddles and updates to the judge for accuracy. We execute interpreter rotation every 25 to 30 minutes to avoid interpreter fatigue. When an interpreter isn’t “on air,” he or she is shadowing their team partner to ensure accuracy and assist in any element of meaning that can arise and must be introduced immediately by the help of “resting and shadowing” interpreter to “on the air” interpreter. At the end of the day, we turn in all notes taken and glossaries to the bailiff for safekeeping. TP: What is interpreter’s fatigue and why team interpreting? RK: Interpreters must work in teams of two or more in all hearings or trials that last more than two hours. This is done because interpreter fatigue is a significant consideration. Consecutive and simultaneous interpreting are very mentally taxing. We are under a great deal of pressure to retain every single element of the source language, and we must rely primarily on memory and note-taking. This leads to a cognitive overload. Most people do not realize that interpreters use at least 22 cognitive skills when interpreting. TP: Do Certified Interpreters have any role post judgment, appeals or otherwise? RK: Yes. There are many instances under which a Supreme Court Certified Interpreter’s services can be used post judgment. For example, criminal cases during Post-Convictions Relief motions. A Supreme Court Certified Interpreter can provide new evidence with a reliable interpretation. Furthermore, in both civil and criminal appeals, certified interpreters can provide reliable interpretation to supplement the record for review. 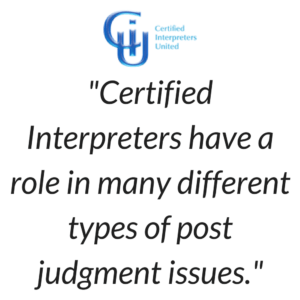 Certified interpreters have a role in many different types of post judgment issues. TP: We had a chance to look at your website before meeting with you. One of the guiding principles of your company, Certified Interpreters United, is innovation. Can you describe what technology you implement in your interpretations that aid in your accuracy and presentation and delivery that Ohio litigators may not be aware of? RK: We use the most advanced and innovative audio-technical and digital equipment for premium quality audio. This approach to complex trials helps guarantee efficiency and quality in our delivery. It’s important because it maintains a record of what is said on the record that is exact, precise and correct, and we are able to get back to it, and the parties can determine if a possible error has been made. Through the use of this technology, it’s done faster and all the information is covered. TP: What is the actual technology? Is it a recording device? RK: It’s a recording device that actually records what is being said by all parties, by the interpreter and by the individual speaking, the main speaker. So the court, all parties and the interpreter can go back and listen to the rendition and the questions being asked or the conversation that’s being held. TP: And if you went back and listened, would the proceeding be paused while you did that? RK: In California, for example, it’s connected to the DAR system, which is the court’s audio system, and it’s actually connected to the record. So the interpreter’s voice is constantly being heard on the judge’s record and recorded. So if a question ever occurs where there’s a misinterpretation and they want to determine if it’s a basis for appeal, then they can go back and listen to it. It’s then heard by a senior interpreter who has nothing to do with the case that’s been recorded on the record. Once that’s heard, then it’s determined if an appeal is carried out or not. And that could be detrimental, because if there’s a misinterpretation and it was not recorded, then perhaps the trial would have to be reheard. In the long run, this affects everyone, including the taxpayers. If a court proceeding or deposition were carried out the right way from the beginning using Judicial Interpreters that have been trained and certified, then the record is sure to be protected and less mistakes are to be made and, therefore, less appeals filed. CG: You mentioned the DAR system that the California court system has. Does Ohio have such a system in place as well? RK: I’ve been told that the interpreter’s rendition is not connected to the judge’s recorded system where they can actually have the recording of the interpreter’s rendition on the judge’s record. What I do know is that the majority of our renditions are picked up by the microphones in the room. That is not exact and precise, because in the simultaneous mode, for example, we’re whispering, so a lot of the rendition is not picked up by those microphones. CG: Would realtime services by a court reporter aid in your interpretation in a deposition or trial setting? Have you ever worked with a realtime court reporter before? RK: First of all, interpreters and court reporters have a very similar role. We both must ensure that the record is exact and precise. 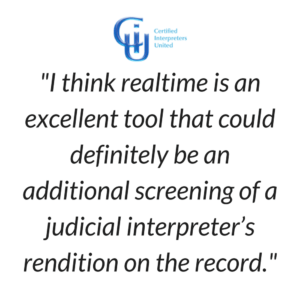 I think realtime is an excellent tool that could definitely be an additional screening of a judicial interpreter’s rendition on the record due to the fact that not only are we listening, but we would also be able to read what is being said in the courtroom or deposition in real time. TP: So it would take some of the pressure off of the retention? RK: Exactly. Therefore, making sure the record is correct and precise. CG: Now that we know more about what you do, when did you decide to come to Ohio from California to start Certified Interpreters United? RK: I came to Ohio two-and-a-half years ago from California. And based on all my training and experience that I was fortunate to acquire in California, I found that bringing it to the Ohio courts and implementing it, along with my colleagues, would be very beneficial for the Ohio judicial system. TP: In addition to being CEO and President of Certified Interpreters United, are you also a member of any professional organizations here in Ohio? RK: Yes, I am. The Community and Court Interpreters of Ohio. TP: What does that organization do? RK: It’s a professional organization of certified individuals, and also non-certified individuals who are in the process of training and testing and finally certification. We gather as a support group within our profession. We attend workshops that give certified interpreters additional continuing education credits. My colleagues put workshops together as well where I have participated. I am also on the advocacy committee for NAJIT, the National Association of Judiciary Interpreters and Translators. CG: Are the individuals that provide these services with you and for CIU contracted through your network that you have in Ohio? Is that what you meant, Todd? RK: All these individuals are independent contractors. There is a roster of certified interpreters on the Ohio Supreme Court website. TP: And just about any language you can cover? RK: Yes. Now, when there isn’t a certified interpreter on the roster and a language is required, like Korean, for example, I find a language-skilled that has at least 80 hours of court shadowing, Supreme Court workshops on judicial interpreting and professional cannons and ethics. Because of the lack of – I mean, they are still in the process of certifying many languages. TP: I understand you’ve been awarded a contract for court work in Cuyahoga County for judicial interpreting services. What was involved with getting that contract, and for which court are you now providing services? RK: I’m now providing language services for Common Pleas, Justice Center, General Division, Juvenile Court, Probate Court and Domestic Relations Court. I presented a bid for proposal, and actually I believe that I won this bid because I was able to depict trial execution and what the judicial interpreter’s profession is all about, and how we work and how we can serve the courts and deliver high quality, professional and personal service to the courts in assisting them in carrying out due process for non-English speaking people. TP: Roxane, thank you so much for meeting with us today. That was great. So much information in here that I never even thought about, and I hope will be helpful to litigators in Ohio who find themselves in need of a Supreme Court Certified Judicial Interpreter for a deposition, or anything. CG: Yes. Thank you so much, Roxane. I know we will be hiring only Certified Judicial Interpreters when our clients need an interpreter for our jobs. RK: Oh, that’s so wonderful. Thank you. And let’s not forget to thank Grace, who has been sitting over here taking everything we’ve said today down. That’s such a crazy skill. It was a pleasure meeting you guys, and thanks for inviting me here for this interview. There are many spokes in the wheel that keep the American justice system rolling; law enforcement, judges, magistrates, attorneys, paralegals, legal assistants, court reporters, videographers, docket clerks, interpreters, filing clerks…and on and on. It’s a very complex wheel, for sure. When any of these spokes are not functioning properly, the integrity of the wheel breaks down. When enough of these spokes are compromised, the entire wheel collapses, bringing the justice system that we all depend on to a crashing halt, creating a roadblock too large for due process to bypass. This may seem like a very dramatic metaphor, but my time spent over the past few weeks with Roxane putting together this article made me realize that in every aspect of our justice system there is a professional there to do their job, to act on behalf of the court with the integrity of the court itself. She made me think outside of my own demographic, my own comfortable place in this world where I don’t have to worry about my voice not being heard or my thoughts being misinterpreted by someone without the proper training. That’s what we’re talking about, right? Due process. 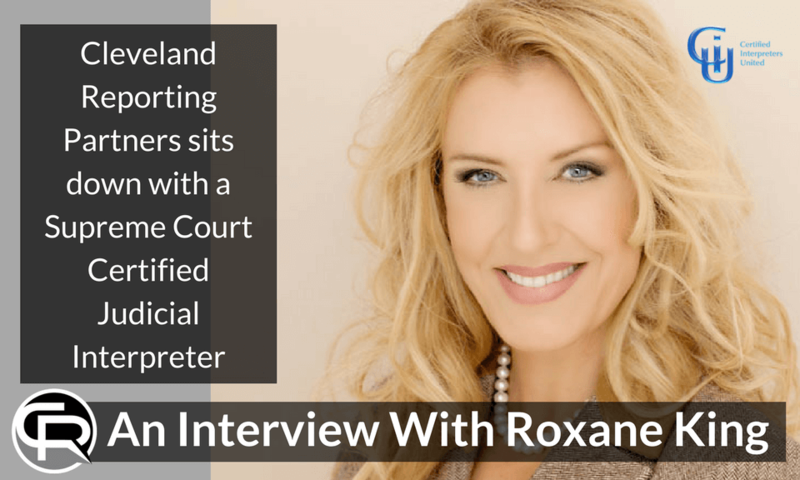 Because of professionals like Roxane, with the proper training in legal interpretation, non-English speaking individuals can enjoy the same rights and voice we all do when we may find ourselves suddenly entangled in the extremely complicated web of the American justice system. To not speak fluently in English should never be the equivalent of giving opposing counsel an advantage, or having a jury confused and frustrated to the point of indifference or unwarranted contempt. It is so apparent to me after spending time with Roxane that she is very passionate about her craft and a truly wonderful person to talk to and be around. But perhaps more importantly, she is an extremely valuable advocate for the due process of those who are so reliant on her talents and dedication, those who need the help of her and others similarly educated to be their voice. Todd L. Persson has been serving the Cleveland legal community as a court reporter since 2002 and is a Co-Founder of Cleveland-based litigation support firm Cleveland Reporting Partners, LLC. He has spoken on the future of court reporting and technology on the Stenographers World Radio national podcast, has had blogs featured nationally by the National Court Reporters Association and the American Translators Association, and has contributed content to the Cleveland Metropolitan Bar Journal. To read Todd’s full bio, visit our Partners page. Connect with him on LinkedIn here. Roxane J. King is a Superior Court of California and Ohio Supreme Court Certified Judicial Spanish Interpreter and owner and President of Certified Interpreters United. Read her full bio here. Connect with her on LinkedIn here.